HallMark, based in Gloucestershire, UK, provides food safety and animal welfare compliance services across the UK. It strives to deliver superior performance by actively engaging stakeholders to deliver innovative and efficient solutions. It provides a managed service to the Food Standards Agency providing Official Controls in abattoirs in Wales and Scotland and Sample Collection Services across the UK. It is also a major provider of Veterinary Reserve Personnel and Expert resources to AHVLA. The challenge was to deliver improved quality at reduced cost. Rather than short-term cost reduction, HallMark differentiated itself by focusing on the retention and development of staff, developing well trained, supported and empowered professionals who could make better more consistent decisions on site. After using MindGenius for a short time John, recognising the benefits and value of the tool and its application, made the decision to obtain additional MindGenius licences for himself and his Senior Management Team. In line with their strategic objectives and with a clear focus on increasing collaboration and creativity, implementing change and process improvement in their key performance areas, John also decided to build on the success of MindGenius as purely a product offering. He engaged the services of MindGenius’ Client Development Services on a training and consultancy basis. 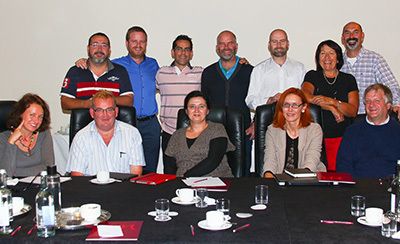 Recruitment PlusA workshop, coinciding with a team building and Conference weekend, was arranged. This included John and all the HallMark Senior Management Team, and was facilitated by MindGenius (Client Development Services). The event focussed on all of Hallmark’s strategic objectives and, using MindGenius live throughout the workshop to capture all the conversations, ideas and input, the team worked collaboratively and creatively to emerge with “Models of Excellence” and Improvement Project Plans for the main areas for process improvement. The event acted as the catalyst for members of the Senior Management Team to take ownership of key areas of business improvement, with one taking a lead role as overall project manager.